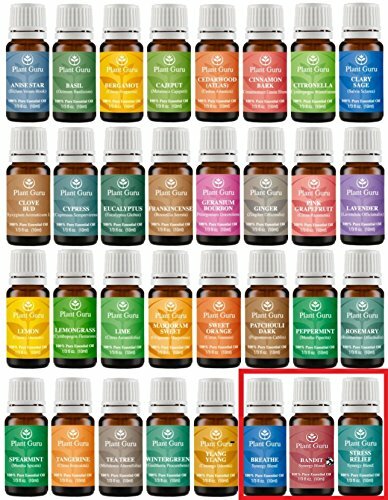 Indulge with this pack of of our top selling 100% pure carrier oils. 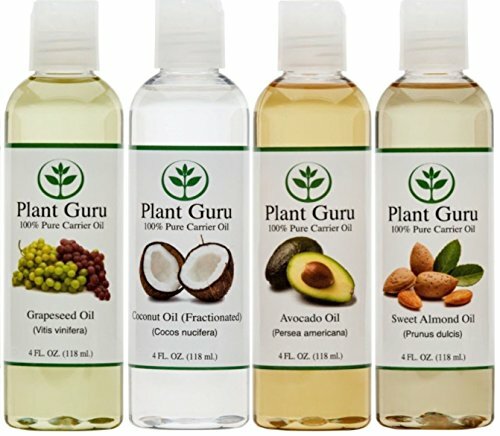 Plant Guru oils have absolutely nothing added and are the highest grade available. Our oils are laboratory tested for contaminants and biologicals and are certified to have no detectable levels of any harmful elements. Fractionated Coconut Oil: Our Fractionated Coconut Oil has been refined through a chemical free steam process to make it clear, stable, and odor free. This oil absorbs rapidly into the skin, making it the ultimate luxurious massage oil. Our Fractionated Coconut Oil contains absolutely no additional or hidden ingredients whatsoever. It is 100% pure Fractionated Coconut Oil and nothing else. Grapeseed Oil: Grape seed Oil is known to have number of benefits. 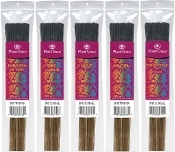 This is fine textured oil which has almost no odor of its own and blends well with other oils. This oil is very good for skin toning and moisturizing. Sweet Almond Oil: Our Sweet Almond Oil is easily absorbed into your skin giving it needed moisture, yet does not clog pores. Sweet Almond Oil is very popular because of it's high concentration of oleic and linoleic fatty acids. Try it as a massage oil and you will love the silky feel! This Sweet Almond Oil has been refined through a chemical free cold press process to make it more transparent, stable, and odor free. 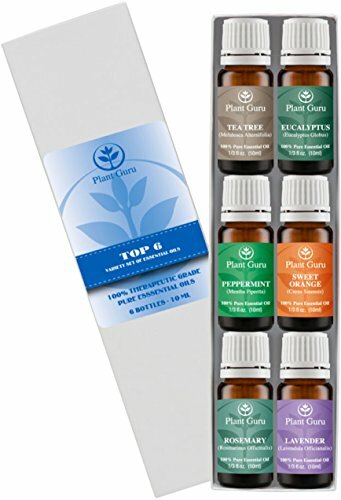 Plant Guru Top 6 Essential Oil Set Contains 10 ml Each of: Eucalyptus, Lavender, Sweet Orange, peppermint, Rosemary and Tea Tree. 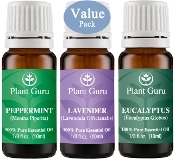 Plant Guru Beginner's Trio Essential Oil Set. 100% Pure Therapeutic Grade 10 ml. 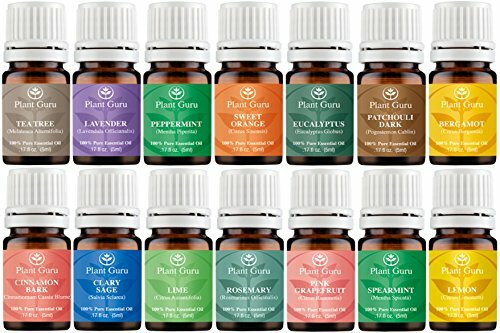 Set Includes: Eucalyptus, Lavender, Peppermint. 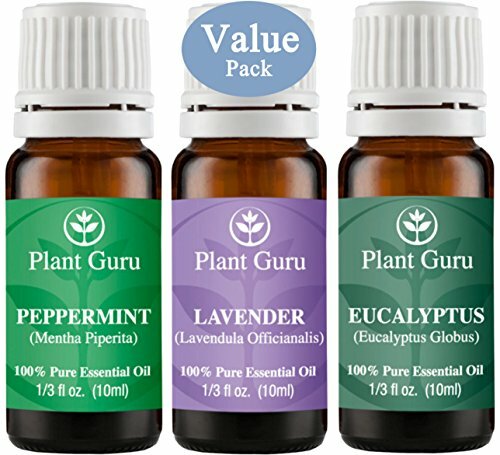 Plant Guru Beginner's Trio Essential Oil Set. 100% Pure Therapeutic Grade 10ml. Set Includes: Eucalyptus, Peppermint, Lavender. ?Bergamot has strong sedative properties that make it an excellent essential oil for fighting stress and stress triggered eating. If you pair it with lavender, it's even more effective. Put a couple of drops on a cloth and inhale the vapors to relax when you feel stressed and tempted to eat. ?Pink Grapefruit essential oil helps prevent water retention and bloating and can also help dissolve fat. The limonene in grapefruit essential oil helps release fatty acids into the bloodstream where the body breaks them down and uses them for energy. Like peppermint, grapefruit essential oil is a strong appetite suppressant. Inhale the vapor of a few drops of grapefruit essential oil to ward off hunger pains or put a drop in an 8 ounce glass of water and drink it before meals. ?Peppermint is an excellent aid to digestion. It can help you lose weight by working on the part of the brain that triggers the feeling of being full when you eat. Add a few drops of peppermint essential oil to a cotton ball or cloth or diffuse it and breathe in the vapors before your meals to reduce your appetite. You can also add 1 or 2 drops of peppermint essential oil to a glass of water and drink it before your meals for the same effect. As an added benefit, it tastes great and will give you a little extra energy. ?Juniper Berry essential oil is credited as being a supportive, restoring, and tonic aid. Good oil for meditation. 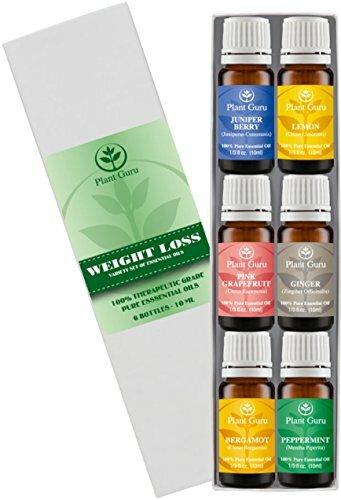 Popular oil in weight loss and detox blends, because it is diuretic, and considered purifying and clearing. ?Lemon Essential oil has many health benefits, and it tastes great! Refreshing and uplifting, 3 drops of Lemon essential oil can turn a regular glass of water in to a lemony treat. Add approximately 3-5 drops per pint of water throughout your day to assist liver detoxification (to help encourage weight loss). ?Ginger essential oil can boost the body's metabolic rate by up to 20% and is recommended for treating obesity. 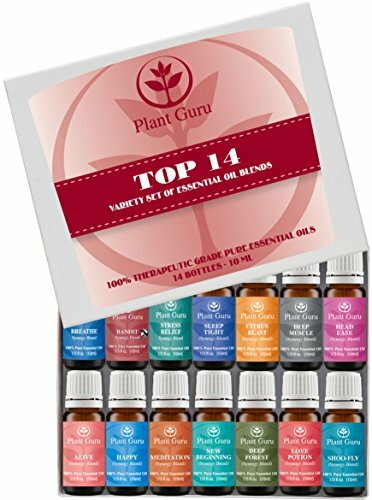 Plant Guru Set Includes 14 - Essential Oil 100% Pure Therapeutic Grade 10ml. 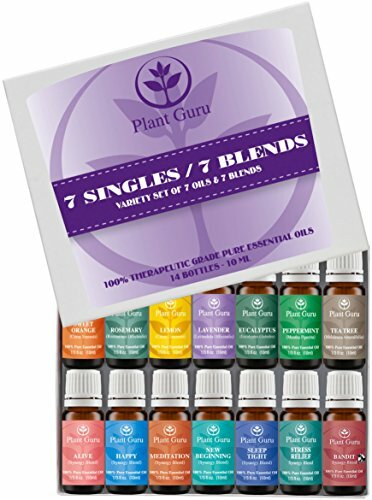 Set includes- (Bergamot, Clary Sage, Cinnamon Bark, Eucalyptus, Grapefruit, Lavender, Lemon, Lime, Patchouli, Peppermint, Rosemary, Spearmint, Sweet Orange & Tea Tree).
? Kitchen Set ? 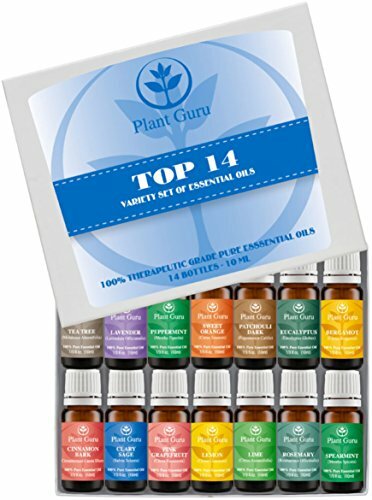 Essential Oil Variety Set- 14 Pack - 100% Pure Therapeutic Grade 10ml. Set includes ? 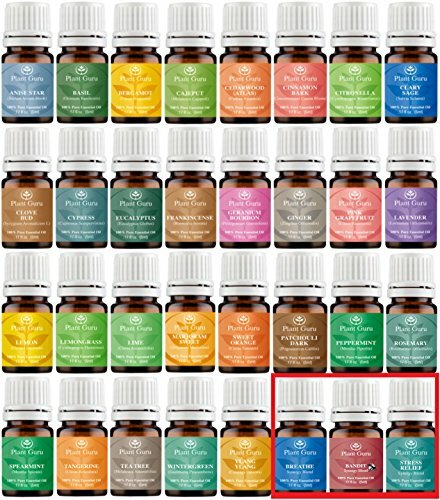 Ginger, Oregano, Basil, Nutmeg, Red Thyme, Vanilla, Clove Bud, Sweet Orange, Lemon, Tangerine, Pink Grapefruit, Peppermint, Spearmint, Cinnamon Bark ? 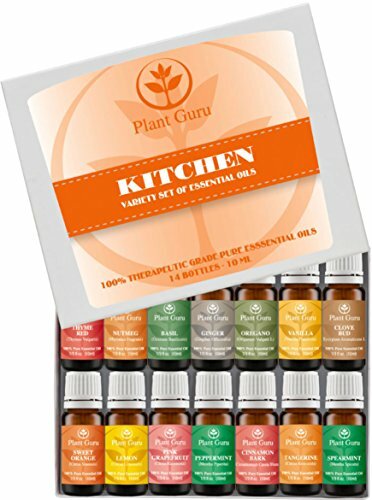 Spice up your kitchen with this wonderful set of pure essential oils. 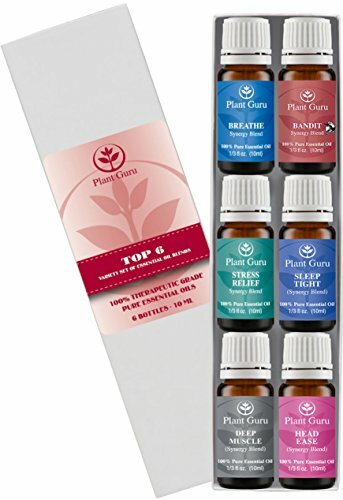 Plant Guru Set Includes 14 - Essential Oil 100% Pure Therapeutic Grade 5ml. Set includes- (Bergamot, Clary Sage, Cinnamon Bark, Eucalyptus, Grapefruit, Lavender, Lemon, Lime, Patchouli, Peppermint, Rosemary, Spearmint, Sweet Orange & Tea Tree).